At Stevenage Blinds one of our representatives will visit you at home, you tell us what you want and we will supply you with our affordable made to measure blinds. 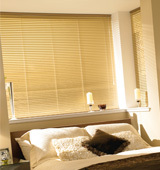 Stevenage Blinds are a local company who pride ourselves on our service, professionalism and delivery. There are NO hidden costs as, unlike several other suppliers, with us you will receive a turn key solution with one FIXED PRICE. Our overheads are minimal enabling us to pass our savings on to you! Welcome to Stevenage Blinds... Your local blind experts! At Stevenage Blinds we have many years of experience therefore providing excellent customer service. We started our on-line site some years ago and now, because of demand, are offering the same service face to face. We offer a genuine affordable bespoke service. 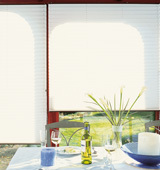 If you are looking for blinds in and around Hertfordshire...look no further as we can assist you all the way. You can contact us by phone (0845 0038057) or by entering your details in the Call Back Form and we will then arrange a visit to your home, or place of choice, with our extensive range of samples. At Stevenage Blinds we provide you with all the information you require to make your perfect choice. Our FREE measuring service is included. All blinds are made in our factory in Nottingham and will be delivered within 5-7 working days of the order being received. Our Venetian Blinds are made from only the best quality aluminium slat and come complete with co-ordinated toop and bottom rails. 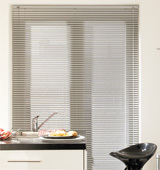 Each blind is made to measure and can be purchased online and delivered to your home within 7 days. All aluminium venetian blinds are easy to maintain and simple to install. Wooden Venetian Blinds are available in 25mm, 35mm and 50mm slat widths, and come with a co-ordinated wooden pelmet and bottom rail. Each wooden blind is made from quality basswood and some of our ranges are available with tape ladders in various colour shades. We have made to measure roller blinds look great in any window, and come in a wide range of plain and patterned fabrics. All roller blinds They are all made with quality aluminium tubing to prevent bending on wider widths and each blind is available with a chain sidewinder control or a spring loading mechanism. View our quality range of vertical blind fabrics online today, all Louvres are available in 89mm fabric widths and some in 127mm. All vertical blinds come complete with all fixtures and fixings and a white powder coated aluminium head rail with beaded and cord controls. 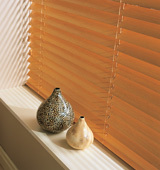 A fantastic style of window blinds for directing the light towards any area of your room. 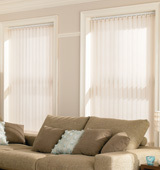 Our Roman Blinds Our Roman Blinds come fully lined with the option of blackout lining if preferred. 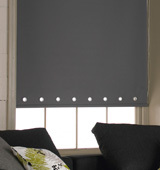 Each blind is made to your precise measurements using quality fabric available online today. 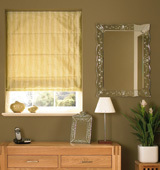 A choice of two headrails is available and all roman blinds can be made and delivered in 5-7 working days. 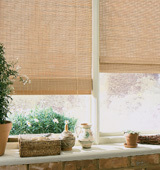 Woodweave Blinds are great for most areas of the home, made from quality bamboo and cane. Lots of wood shades are available which will blend to most decor around the home. Woodweave Blinds are made with a strong robust head rail covered with a co-ordinated pelmet and controls are available on the right or the left of the blind.